When the leading candidates for America's next presidency traded barbs this week during the first presidential debate, political operatives and energized voters were hard at work sharing opinions (and insults) on Facebook, Twitter and other social media sites. Much of today's political discourse starts on social media, and the medium often amplifies vitriol and slants information. The 2016 presidential election isn't the first event for which social media has been used as a political tool, but today it carries tremendous weight and influence over the electorate. 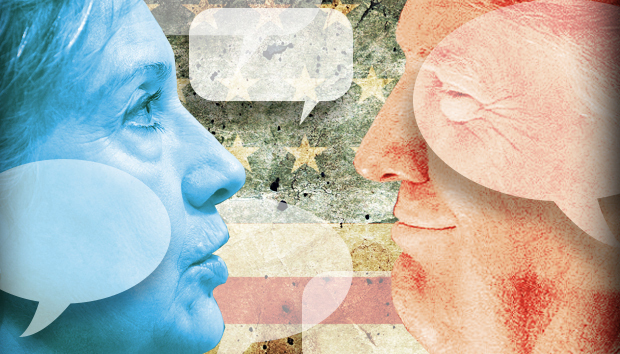 Hillary Clinton and Donald Trump both use social to their advantages, but it's often the surrogates, supporters and influencers who shape perceptions, according to whatever views serve their preferred candidate's interests. Never before has a "like," retweet or otherwise mindless online activity been so reflective of the state of American politics. Social media acts as glue for like-minded people, and it can reinforce their confirmation biases. "Psychological research shows that people really want confirmatory information," says Karen North, a clinical professor of communication and director of the digital social media program at the University of Southern California (USC). "Not only do they want to know what's up, they want to have opinions, and they want to find like-minded people to tell them why their opinion is correct. It doesn't mean the people won't change their opinion, but it feels better to find people who are supporting you and telling you why your opinion is right." Many people seek out echo chambers on social media, according to Vincent Raynauld, assistant professor in communication studies at Emerson College in Boston. "Even though social media allows people to be exposed to different political views, people tend to be part of environments where their political opinions are constantly reinforced." Social media democratizes information sharing, and it helps individuals with very narrow interests quickly and easily connect with others who share their beliefs, Raynauld says. Sensational headlines and memorable memes give rapid-fire politics momentum on social media, he says. Social is the "most important platform for the millennial generation," Raynauld says. According to a survey of 3,760 U.S. adults by the Pew Research Center, 35 percent of people 18 to 29 years old say social media is the most helpful source of information on the 2016 presidential election. "It's become the go-to tool for politics, whereas older generations are still relying on traditional media," Raynauld says. Social media gives people the power to organize and inform, but it's also frequently used to exhibit narcissism and ignorance, according to Brian Solis, principal analyst at Altimeter Group, a research and advisory firm. Such behavior reflects the uglier side of political discourse, he says. Many people simply haven't learned how to be civil on social sites, according to Solis. "Instead we use the channel as a way of imposing our perspective and thrust it upon our community in ways that have been incredibly divisive and unproductive," he says. "What we're seeing is the psychological and sociological impact of social media on society." The Clinton and Trump campaigns also expand the power of social media beyond the people who regularly use it, according to Dave Marinaccio, CEO and cofounder of marketing communications firm LMO Agency. "The campaigns can influence the traditional media by reacting to, or creating, newsworthy social content," he says. "They can engage a much larger segment of the electorate than they would solely through social media outlets. Even people who don't use social media feel its influence daily." The average expectations of modern news and commentary also change as people gravitate toward more curated experiences, according to USC's North. The things that catch a person's attention on social media may seem serendipitous, but they often aren't random, she says. "Our friends and the platforms on which we live our digital and social lives can send us information" that stokes our passions. Political strategists can also seek out segmented audiences and feed them information in a way that is specialized to their own interests, North says. "Social media is the hope of all political efforts these days, because it finds people wherever they are that week and that day," North says. "It is completely amplified by your social decisions online because only certain parts of what these influencers say is shared. And the stuff that's shared is probably more polarized, more interesting, more entertaining and more engaging than the stuff nobody chose to share." Today, the medium is often an "ugly soapbox" for politics because people can easily exert their opinions with a few keystrokes, according to Solis. "It brings out the darker side of digital introverts in that we are willing to say anything … without logically thinking about its impact on what's reality and what people will think about us beyond this election." Solis says the potential ramifications of social media on America's collective political psyche are disconcerting and worrisome. "We are not behaving like adults, and we're supposed to be leading the future of this country," he says. "We're voting for our children, and this behavior online is incredibly selfish."